Appearance: Elsie is a thin canine with slender curves. Her fur is made of patches of different shades of earth tones. 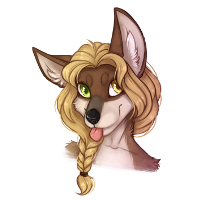 She keeps her sandy blonde hair in a loose braid, tied with string, mainly to keep it out of the way while she's sewing. In her Optime form, Elsie stands at 5'4" tall. She wears a variety of clothing or sometimes none at all, depending on what she's doing. She also tends to trade the things she wears as long as they're still in good condition, so it's common to see her in different clothes. Art by Requiem Personality: Elsie is very high energy, spunky, and a bit of a spaz. Her emotions are big; if she's happy, it's obvious, same with sad, angry, or however she's feeling. She's also somewhat nosey and a bit of a meddler. Although Elsie has found that sometimes others don't like when she pries, she does it because she cares and she wants to see her loved ones happy - especially if there's something she can do to help. Elsie loves to learn and will try anything once, even if she thinks she's going to fail miserably at it.